Our weather has been acting quite tropical. We’ve had weeks of extra hot and rainy, humid days. Tropical cookies fit right in! Coconut Milk Cookies are a crunchy treat inspired by Thai cookies called Tong Ek (Golden Cookies). Coconut milk plus shredded coconut add tropical flavor and cacao nibs add crunch. These cookies are a little bit exotic and a lot delicious. In the United States, both in big cities and smaller towns, it is usually easy today to find ethnic foods at the regular supermarket. Salsas and Siracha are stocked along with ketchup and mustard. Tofu, hoisin sauce and won ton wrappers are generally easy to acquire. Belgian Biscoff and Italian Nutella sit on the shelf right next to all-American peanut butter. I am so accustomed to this convenience, that I sometimes forget that supermarket inventory wasn’t always so diverse. A long time ago, when I was in high school, my family moved from New York (via 2 years in Europe) to South Carolina. Grocery shopping produced culture shock. Supermarkets in the 70’s weren’t the coast to coast companies we are used to today. Small regional stores stocked products for the local palate. There was no internet to expose and flaunt the world of food. For the first time, we encountered pimento cheese, black eyed peas, greens (such as collard greens, mustard greens, turnip greens, or poke), and okra. No one seemed to know what a bagel was. Today, national chain supermarkets provide a wide array of choices. 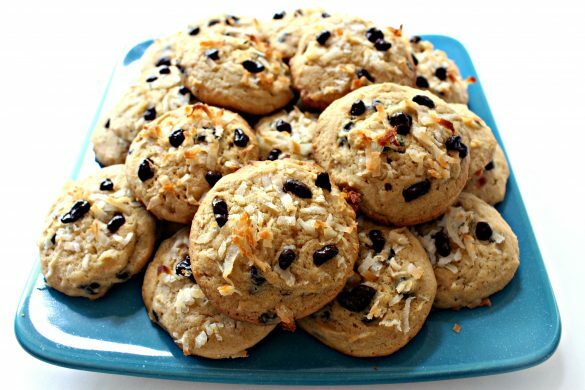 The inspiration for Coconut Milk Cookies came from a newspaper article from 1967 and a cookbook published in 1987. The recipe in both sources was identical, though the directions for making the dough were quite different. Both recipes, published 20 years apart, noted that coconut milk was a “hard to find” and gave directions for making it at home. I was amazed. First, I can’t remember when coconut milk wasn’t a standard supermarket item. Second, homemade coconut milk is easy to make? Who knew? Because we are all up-to-date, modern world, never-have-enough-time people, I decided to make the Coconut Milk Cookies with canned coconut milk. It worked great and saved time. 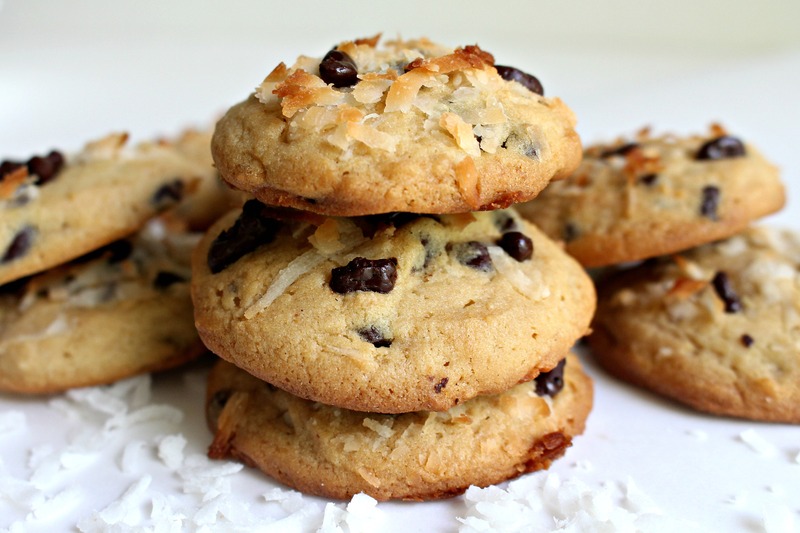 The coconut milk gives the cookies a delicate coconut taste and smell. However, have you ever read the ingredients on a can of coconut milk/cream? Technically, coconut milk is a liquid extracted from coconut meat. The can of Trader Joe’s coconut cream I used, lists as the ingredients as: coconut extracted, sodium carboxy methyl cellulose (a synthetic gum that provides creamy taste), xanthan gum (another thickening agent), and water. 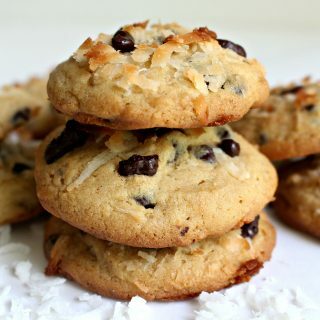 If that bothers you at all, and you have an extra 30 minutes, my Coconut Milk Cookies recipe includes optional directions for easily making your own coconut milk or cream. I love finding out that I can easily make things myself that I had never considered making before. For ½ cup of coconut milk, combine 1 cup of unsweetened shredded coconut with 1/2 cup of water in a small sauce pan. Bring to a boil. Remove from the heat and allow the coconut to seep for 30 minutes. Strain out the coconut and the remaining liquid is coconut milk! For coconut cream, follow the same process using milk instead of water. Coconut Milk Cookies are quick and easy to whip up (even if you make your own coconut milk)! No mixer is needed for this easy dough. Coconut lovers are sure to be delighted with each crunchy bite! In a large mixing bowl, whisk together the flour, baking powder, salt, and brown sugar. Cut in the butter with a fork, until the dough is crumbly like coarse meal. Mix in the yolks, vanilla, and coconut milk. Fold in the nibs (or chocolate chips) and coconut until evenly distributed. Using a small (2 teaspoon) scoop, place balls of dough on the prepared baking sheet 1”-2” apart. Top each dough ball with a pinch of coconut and a few cocoa nibs (or mini chocolate chips). Bake for 12-14 minutes until golden brown. Cool five minutes on the baking sheet before moving to a wire rack to cool completely. **To make homemade coconut milk: In a small saucepan combine 1 cup of unsweetened shredded coconut with ½ cup of water. Bring to a boil. Remove from heat and allow the coconut to seep for 30 minutes. Strain out the shredded coconut through a sieve. To make coconut cream follow the same process using ½ cup of milk instead of water. 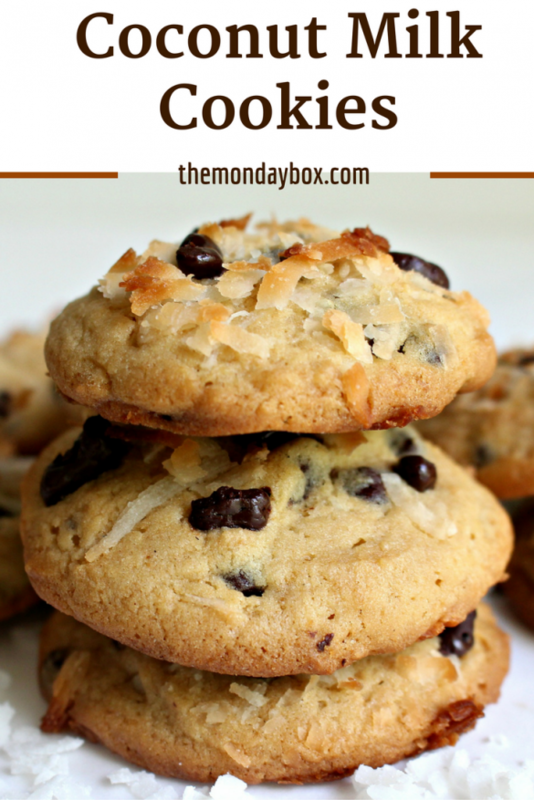 For hot weather care packages, use only a sprinkle of coconut as the decoration on top of the cookies. Cacao nibs or chocolate chips might melt. However, the chocolate is fine inside the cookie. Wrap small bundles of 2- 3 cookies, bottoms together, in plastic wrap. Stack the bundles in a column in a freezer weight zip lock bag or airtight storage container. I suggest using the left-over coconut milk in Coconut Milk Toffee Blondies or Coconut Milk Chocolate Chip Pound Cake! 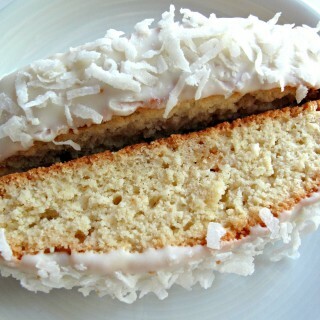 Coconut lovers have also enjoyed these recipes! What a fun and unique cookie. Who knew you make homemade coconut milk. I agree, we are quite spoiled these days! Thanks, Chris! Finding out about homemade coconut milk was a definite bonus to this recipe! Dog walking becomes complicated when you have to watch out for crazy hot temperatures and major thunderstorms! These cookies were my first venture into baking with coconut milk. I was so pleased with the results that I am already experimenting with using it more! YUM! I kinda want these for breakfast! They look so good and I can hardly wait to try them. Thank you, Susan! I think these cookies would be a lovely way to start the day! We’ve had the same weather! I didn’t know coconut milk was so easy to make! I feel like making some right now. . . then these cookies! They look and sound delicious! Do the cocoa nibs soften when baked? I only tried them once and they were quite crunchy. Thanks, Reeni. The home-made coconut milk really surprised me too! After I read the directions, I couldn’t help trying it! The cacao nibs from Trader Joe’s are coated in chocolate. The nib part gets softer over time in the cookie, but the nib stays pleasantly crunchy. I have had plain nibs before that felt like I was eating bits of shell. Yeah, I want to use them for crunch, but I would rather not break my teeth! The cacao nibs at Trader Joe’s are tasty and just-right crunchy. Thanks, Tricia! Yikes! 108° is HOT! Maybe save baking until it cools down! 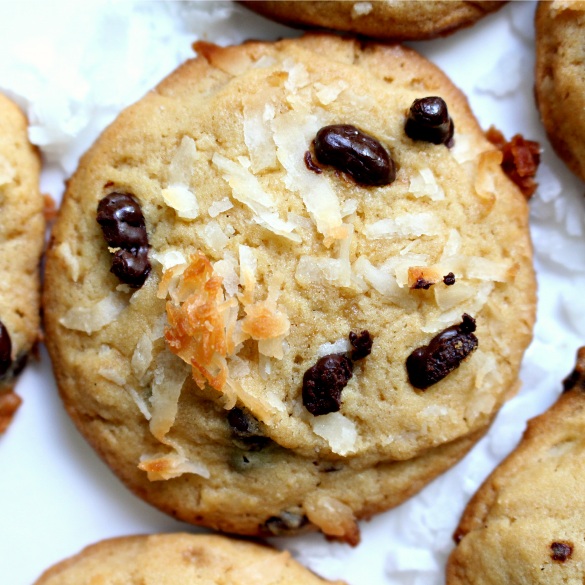 Baking with coconut milk was new for me and it made a real difference to the flavor of the cookie. You’re so right about how much better and more diverse the grocery scene has gotten. I grew up keeping kosher in Indiana, which was really hard. I think there were a few brands we could eat, and the rest we had to make from scratch. Now everything is available, even though I don’t live in Indy anymore. It would be easier now, though. These look incredible! I trust Trader Joe’s, so I’ll buy their stuff. 🙂 These look so thick and chewy! Thanks, Mir! It is interesting to me when I notice a lot of mainstream foods that have kosher certification and sizeable kosher sections in mainstream supermarkets. I remember when it wasn’t like that at all. I can imagine how difficult it must have been years ago to keep kosher in Indiana. Wendy, anything coconut makes me very happy. These look so chewy and delicious. I am curious to know how different they are with coconut cream vs coconut milk. 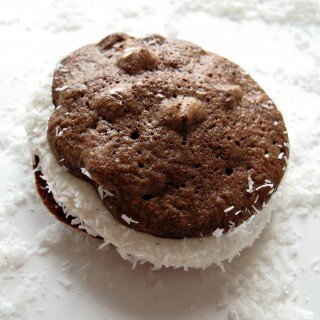 Do you think it’s worth the extra calories to go for the coconut cream? I’m suspecting the answer is yes. Interesting question, Cindy. I used coconut cream because that is what I had on hand, and I’m not sure that coconut milk would have been any different. There is already 1/2 cup of butter in the batter, so I don’t think the fat in the coconut cream vs lower fat (and calories) in coconut milk would have impacted flavor. The extra fat might make the cookies a bit softer and chewier though. Wendy, I made a double batch of these to take to my son and daughter in law who have a new baby. I found them easier to scoop after cooling in the fridge for a few hours. 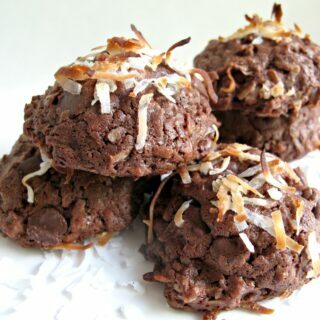 I used TJ SS chocolate pieces, topped the cookies with some coconut and a tiny sprinkle of Maldon salt, and then lightly drizzled them with melted SS chocolate once they had cooled. They were a huge hit, and I will be making them again. Thanks for an easy and interesting new cookie to add to my repertoire. 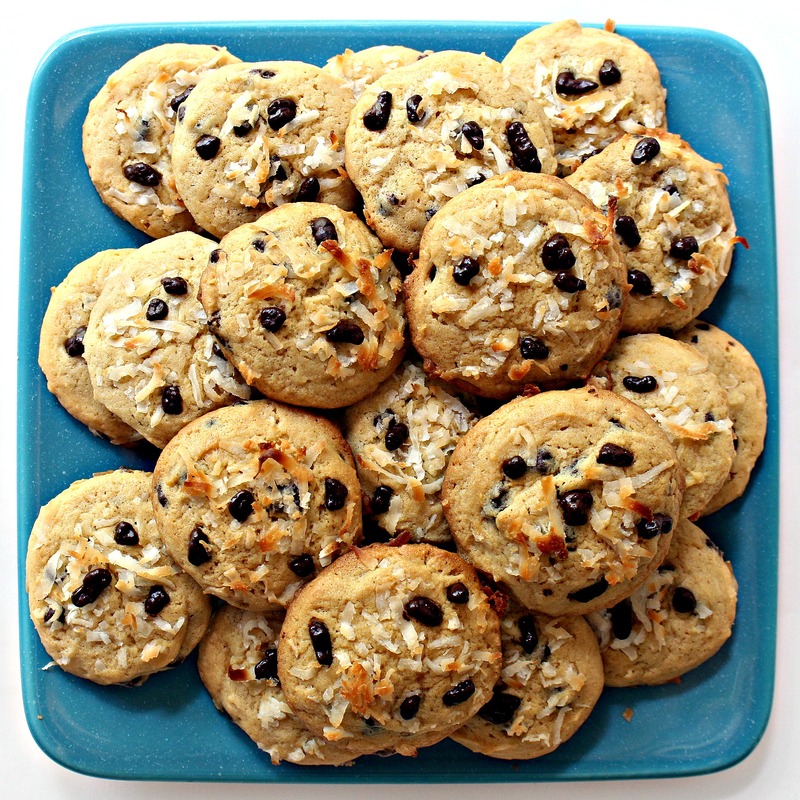 I just pinned your awesome Coconut Milk Cookies, I really need one right now. Hope you are having a fantastic day and thanks so much for sharing with Full Plate Thursday! Thanks for pinning, Miz Helen! I hope you have a great day as well! These cookies look so delicious, Wendy! 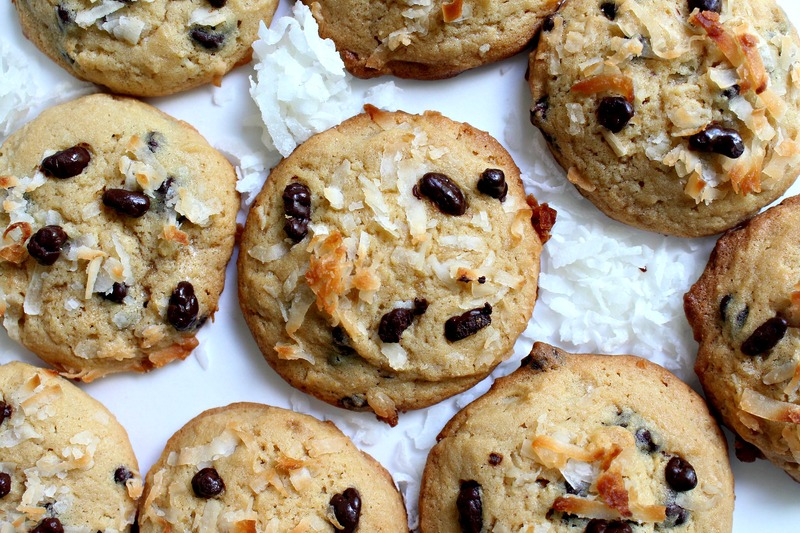 Count me in for anything coconut, and I love the addition of the cacao nibs. I may have to try my hand at making coconut milk. We get so accustomed to modern conveniences, and sometimes back-to-basics is the better way to go. Thanks for the recipe! Thanks, Stephanie! I know a lot of people think it is crazy to make an ingredient yourself when the ingredient can be purchased instead, but I get excited and amazed learning to make things that I had no idea could be made at home! I very well remember the days you were talking about!! I am still in culture shock because my folks moved to a small town in South Dakota and every time I visit I bring ingredients from the Twin Cities!! These cookies are new to me and I’m going to have to give them a try! Maybe I’ll drizzle a little chocolate on top so they remind me of a Mounds Bar!! Thanks so much for sharing with us at Throwback Thursday!! Small town life can be a real adjustment when one is used to the conveniences available in a larger city. I think adding a chocolate drizzle on top of these cookies would be delicious!! I’d love to try this because I just love coconut milk, even when I didn’t love coconut per se back in the day. Thanks for bringing us this unique cookie! Thanks, Monica! Coconut milk in baking was new to me and the idea that I can easily make coconut milk/cream at home amazed me! I don’t love coconut milk on its own, but I love it when added to savory and sweet recipes. Hiii! Making these lovely cookies right now. They smell great in the oven! But, I wasn’t sure at what temperature to bake them – either I’m blind, or there’s no temperature listed here. I’m not at the level of baking expertise where I can know the best temp off the top of my head (yet, hehe), so I googled it. I’m baking them at 350. Is that… right?? Anyway I’m sure they’ll come out delicious no matter what. Thanks for sharing this recip! Hi, Maria! I sure hope your cookies turned out as good as they smelled! You were correct about the oven temperature, 350 is correct. I have added that very important detail to the recipe where it belonged! Thank you for pointing that out! Funny to read about making your own coconut milk. I think the result will be much thinner though? More like coconut water? Or am I wrong? Coconut milk from a can always has a slight fat content as well. It’s my first time baking coconut cookies and it somehow came out dry outside but cakey inside, with not much of the coconut taste. I used coconut cream. The raw dough tasted better for me tho, weird! Hi, Anna May. I think you you baked the cookies just right. First, the texture you describe sounds right. These cookies are a bit crunchy on the outside and softer (almost cakey) on the inside. Second, the flavor of this cookie is more the flavor of cooked coconut milk, kind of mild. If you want a more pronounced coconut flavor, you could add a bit (1/2-1 teaspoon) of coconut extract. I have to be honest. I don’t know what will happen once the timer goes off because I started out using a vegan recipe (accidentally) then once I had already mixed a few ingredients I felt that the recipe was missing something. I then stumbled upon your incredible recipe but didn’t have 1/2 of the ingredients listed. LOL. So no eggs, cacao nibs, shredded coconut or vanilla. However, I am optimistic! I will report back soon! WENDY, what a gorgeous cookies ! Your directions make this seem like such an easy approach, too. I would love to make this soon!